I love that VW is now offering 45 colors to choose from on the Golf R.
That teal color is to die for! Wow, thanks for sharing the cool colors! I have been complaining for ages about how boring most paint jobs look these days. I don't really know if I can pick a single favorite color. The color has to work with the style of the car, and what I would like on one, I would not care for on another. One thing I am less than crazy about is some of the new golden/brownish paint jobs. They remind me of ugly kitchen appliances from the 70s. I also tend to prefer colors that look pure and fresh, for lack of a better description, as opposed to those that seem sort of "muddy" to me. That can be a close call - two colors that are actually pretty similar, and I like one and hate the other. If I lived in the blazing hot southern part of the country, I’d buy a white car, too. My first new car many years ago was black. Unless I had a servant to wash it every day, I’d never own a black car again. How is a primary color "boring" but another solid color "excites you"??? "WOW, My car is an EXCITING GREEN!!!! " and get all hyped up the rest of the day? I prefer not to buy black because it gets hot. White because it shows dirt, and if prefer to skip pink or neon green or whatever.... But I really don't see how a solid color can be "exciting"
But a regular solid color: please explain. 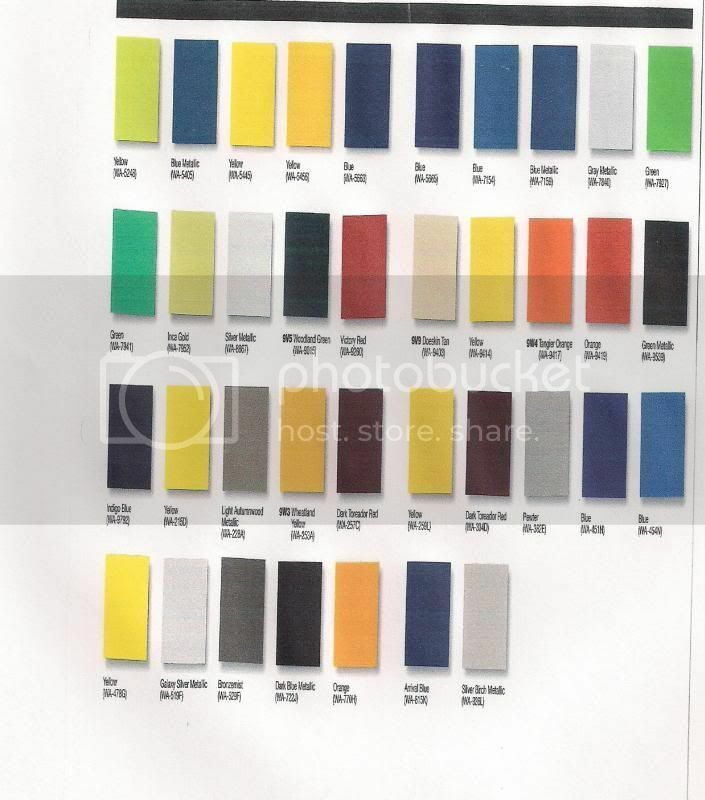 General Motors offers these colors for businesses and fleets. SEO colors. Special order colors. Some no cost extra some with an added fee. Most cars are bought right of off dealers lots. While a funky teal metallic might really get one person excited, it will probably turn off 30 other people, so they play it safe and stock the grey and white ones that people find neither exciting nor offensive. I just bought a 2019 G80 3.3T Sport in a color called Polar Ice. In fact, I'm flying up to D.C. in a few hours to pick it up and drive it home to Miami because no other closer dealer has one right now (and I like road trips). It's sort of a sparkling pale blue and is simply gorgeous (at least to me). I'm going to link to a YouTube review below of the MY18 car (and the color) below, but pictures don't do it justice. In fact, the reviewer discusses the color starting at about the 1:00 minute mark and says just that. Our other car is a two-seater red convertible (SL500). I've never owned a black or a white car and fail to see the attraction to those colors, although I'm sure that there are some people who think a blue car looks ridiculous. "I'll never understand how someone will buy a new car and have a whole spectrum of colors to choose from, and they settle for white." There is the safety factor of ;lighter colored cars. There's a safety factor of brighter cars, not lighter. A white car (or silver) does not stand out as well against the background as an optic yellow, fuorescent green, or Ferrari red, or even electric blue (even though we've less sensitivity physically to shorter light wavelengths) in day light. Our eye is much more sensitive to bright colors, and novelty than just bright, since variations of equal RGB frequencies are VERY common, which makes them less noticeable. Day driving optic yellow or fluorescent green are the most visible, at night white is the most visible, closely followed by optic yellow or fluorescent green. So if you drive only at full dark get white, otherwise get yellow/green if safety is your primary concern. I bought white cars because I used to live where it was pretty hot, so the white, plus tinted windows, kept the cars cooler. Now I wish they were black, because I live in mudville so they’re always dirty. I had an MG and it was British Racing Green, any other color would have looked silly. I have seen lots of orange cars lately, no thanks!